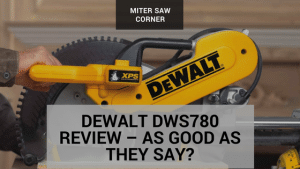 →Dewalt DWS780 Review – As good as they say? Dewalt DWS780 Review – As good as they say? ​The Dewalt DWS780 is a popular, easy to use, and precise mitre saw that is well recommended as a high capacity saw for both amateurs and professionals in the woodworking world. It has multiple features that make it both easy to use and safe (no danger of injuries to your hands). This powerful mitre saw will ensure that you can cut large pieces of wood with precision and confidence, but’s it’s not so hot on smaller pieces. Before you buy, you should know what you’re looking for in a mitre saw as well as the pros and cons of your options. Read on to get an unbiased review on this miter saw. Dewalt DWS780 vs DWS782: Which is better? For anyone whom this mitre saw might not work for, I’m going to start right off the bat with what I don’t like about this product. Firstly, this mitre saw is touted as an all-rounder saw for both amateurs and professionals, but I believe there should be a distinction between different types of amateurs as well. If you are someone who is not going to use this saw regularly then the storage and weight of the saw is definitely a drawback. The saw and table take up a large amount of space in a garage. The saw is also very heavy, although it is more portable than most mitre saws of this size and its power and performance makes the weight worthwhile. I would say that if you’re not cutting industrial sized pieces of wood every day then this miter saw is unnecessarily big and powerful for your needs, however, if you do need a saw for large pieces of wood with precision then this saw provides more portability than most others and cuts very precisely and accurately. Having a mitre saw with multiple capacities is a necessity if you work on many different kinds of woodworking projects. This is especially true when larger pieces need to be cut. With a majority of mid-range mitre saws you are limited to which size pieces you are able to cut unless you have a large capacity stand. The DWS780 has the ability to cut pieces at a 90 degree angle that are up to 16 inches wide. That is a very wide range, generally not seen on a mitre saw of this size and price range. ​One of this model’s benefits is its ability to cut vertically and horizontally concurrently, which helps to make more complicated cutting jobs manageable and makes them go that much quicker. This type of feature is also available in the newer model, the Dewalt DWS782. The DWS-782 has some advantages and is priced more competitively than the DWS 780, however, the features that were cut make the DWS780 the better choice, in my opinion. For example, the 782 does not include the LED light feature. LED light is located in the XPS cross-cut alignment system (also missing from the cheaper DWS 782. The LED is designed to cast a shadow of the blade of the miter saw onto the work surface, which shows you precisely where the blade is going to cut. This feature works for effectively than your typical laser system, and is precisely what makes the 780 so easy to use. An added advantage of this alignment system is that unlike with a laser guidance system, you don’t have to do any recalibration when changing blades, as the light uses the blade itself to create the shadow. A second difference is that the Dewalt DWS782 comes with a cheaper blade (32 T carbide blade rather than a 60 T), which makes it less effective at cutting precisely. However, the design change that compensated for this is that the Dewalt DWS782 has an ability to adjust down to a smaller size when cutting (not available in the Dewalt DWS780). Overall the DWS-780 is the better model simply due to the alignment system and better quality blade. To have a light fitted to the 782 will cost more than simply buying the 780 and the more durable blade will give you much cleaner lines for longer. 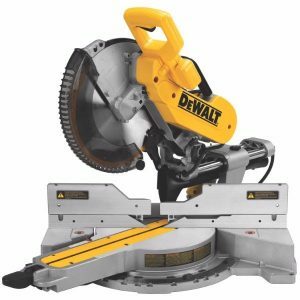 The DWS780 is undoubtedly worth what you pay for it as one of the best mitre saws under $600 (at Amazon) with features such as the LED and a see through fence which are not found on other saws in the same price range. It’s worth it to pay a couple hundred dollars extra for the 780 over the 782 and know that you’re getting everything you need the first time. The retail price is usually higher than the Amazon price and the shipping is free. You do not need to go to various hardware stores and compare prices and coupons and whatever, just order the saw and it will be delivered within a couple days. There can be extra goodies offered on Amazon with the this miter saw depending on when you order. Lastly, you can read the Amazon reviews and get an honest opinion about the saw over and above this review. When you buy this product by Dewalt from Amazon, it automatically includes the standard warranty that you would find in any hardware store: 90 day money back guarantee, one year service, three year limited warranty.